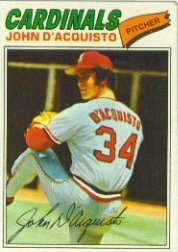 Pitcher John D’Acquisto did more than win a dozen games and a couple of awards in 1974. He achieved his own share of history while having a good bit of baseball fun. Start with June 7, 1974. Whenever a pitcher blasts a homer, bet that there’s a good story behind the four-bagger. With thanks to http://www.retrosheet.org/, heeeeeere’s Johnny’s! “The game was tied in the 8th inning against the Pirates and bing crosby was in the stands because he owned a percentage of the Pirates. Bruce Miller walked and Larry Demery had gone 0-2 on me in the count. I was looking for a fastball away and he threw me a fastball right down the middle. I took a swing and my eyes lit up like a Christmas tree. I hit right on the sweet spot and ripped it into right center field, a line shot. “In any five-year period, there are 40 guys who are claimed by someone to be as fast as Walter Johnson, or as fast as Bob Feller, or as fast as Nolan Ryan, as fast as whomever the standard is at the moment. People made the same exact sort of comments about Pete Broberg that they did about David Clyde. We have the same kind of quotes about Gary Gentry, claiming he was faster than Seaver. “My career was a good career based that I was on teams that never really did well, yet I was able to put together some great years and made those teams competitive in their own right. It was an honor to be able to play Major League Baseball for as long as I did. I have no regrets on my life after baseball. Things happen to good people and they change your perspective of life and trust of others. I learned from my mistakes, that is the key. More great “Johnny D” memories were shared in this 2005 profile from J.D. Hawk. Tomorrow: what would you do if manager Billy Martin ordered you to throw a spitball? Go Johnny Go johnny Go! Great to see this blog as I and the crew at San Diego Metro Credit Union admire the picture and the caption . Miss the flamethrowers of yesteryear like you!